The Canine Heritage XL Breed dog dna test is a simple test you can do at home. This canine dna testing kit is easy to use and recognizes over 100 breeds. A DNA CheekSwab kit will be sent to you for DNA collection. 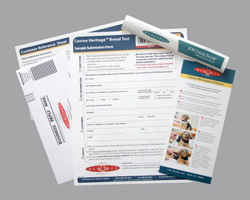 Once the dog breed test sample is collected, you can return the kit in the pre-paid return mailer using regular US mail - no special handling is required. The process is simple. Wait at least a half hour after your dog has eaten to avoid picking up food debris. Use the cheek swab to get a sample of cheek epithelial cells by turning the bristles away from your dog's teeth. Is a cheek swab as accurate as a blood test? DNA is found in almost all cell types, including hair roots, muscles, reproductive cells and skin cells. According to the American Association of Blood Banks, of the nearly 1 million DNA samples submitted to DNA testing labs in 2006, over 98% were buccal cheek swabs. Less than 1% were blood samples. The Today Show's Meredith Viera used this test to find out that her Aussie - Poo Jasper, was actually a Collie / Shetland Sheepdog / Borzois mix. To her surprise, no poodle DNA was identified. 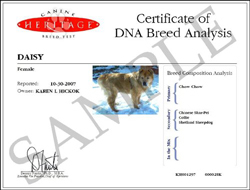 Between four to eight weeks after returning the sample, you will receive a Certificate of DNA Breed Analysis, suitable for framing. This can be personalized by uploading a digital photo of your dog. Contains 50% or more of a specific breed. Most mixes will not show a dog breed in this category unless one of both of their parents are purebred. Contains easily recognizable dog breeds. Those listed will have a strong influence, but each breed makes up less than the majoruity of your dog's DNA. This will show breeds that have the least amount of influence, but they still appear at a measurable amount.